A Ukrainian serviceman was killed in a car bomb explosion in the center of Kiev on Tuesday, the interior ministry said, describing the incident as a "terrorist act." 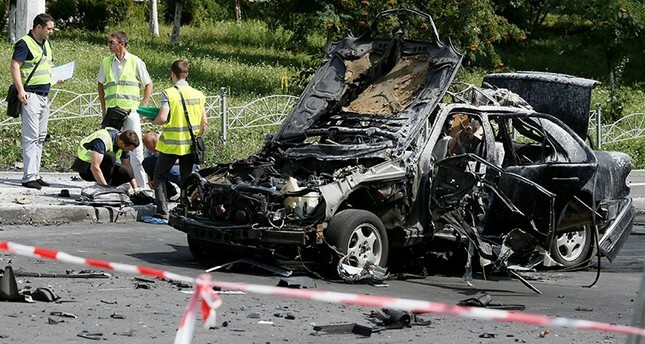 Ukrainian police said in a statement on Tuesday the driver of a luxury car was killed instantly as the vehicle blew up at an intersection Tuesday morning. Two other people were injured by the explosion, reports said. "The deceased was a serviceman in the armed forces," ministry spokesman Artem Shevchenko said at a briefing. Shevchenko said that judging by initial indications it appeared "obvious" that the blast was caused by an explosive device, adding that investigators were probing it as terrorism. "At the present time the picture gathered of the crime suggests it was a planned terrorist act," Shevchenko said. The ministry said the dead man was driving the vehicle. The Ukrainian Defense Ministry said that the deceased was a member of the ministry's main intelligence department and identified him as Colonel Maksim Shapoval. The blast is the latest deadly incident to rock the capital of the crisis-hit country, which is battling a bloody Russian-backed insurgency in its eastern regions. Police said they were treating the incident as an act of terrorism and have launched an investigation to find the perpetrators. Reports said that the incident is the second one in four days.